In a crowded market like the Los Angeles mobile food scene, it’s tough to differentiate one truck from the next. Each one has a clever name, a nifty logo, and a bill of fare that sounds tastier on paper than it actually is in person. 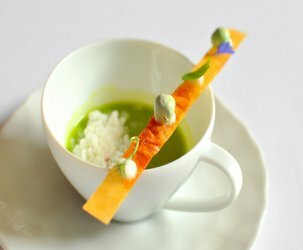 However, the debut of the World Fare Bustaruant was different enough to turn some jaded heads. Instead of a traditional roach coach, Travis Schmidt and Jason Freeman bought a vintage double decker bus. And rather than fusing a random cuisine with Mexican fare, they introduced something totally different—South African “bunny chow.” The Astronomer and I, along with Donna of Dishy Goodness, ran into the bustaurant after a long day of powwowing at the Food Blogger Forum. Even though dinner plans were around the corner, the lure of testing out a well-regarded truck proved too enticing to resist. 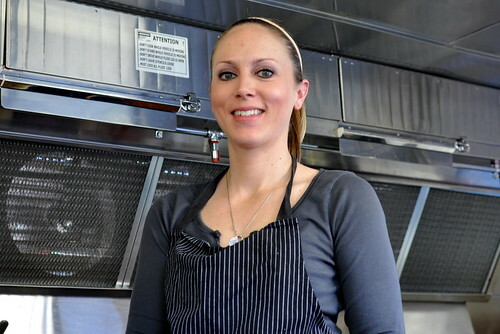 After four years as Corporate Executive Sous Chef for the Michael Mina Group and two seasons as sous chef in Gordon Ramsay’s “Hell’s Kitchen,” Andi Van Willigan hopped on board the bustaurant to man the moving stoves. The bus’ two tiers are utilized to the fullest—there’s a (relatively) spacious kitchen for the chef and a rooftop dining space for customers. We started off with a complimentary order of Truffle Mac and Cheese Balls ($3). For me, the best part of a mac and cheese experience are the bites with a few gooey noodles and lots of crunchy breadcrumbs. Thus, these crisp balls were totally to my liking. The truffle essence was a nice bonus. From what I understand, bunny chow is of Indian origin, but is considered a South African dish. 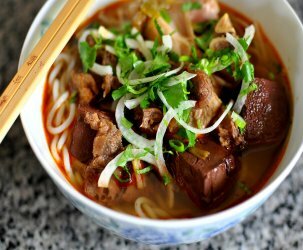 It’s comprised of hollowed-out bread filled with savory stews and curries. The Short Rib Bunny ($4) with Worcestershire braised short ribs and horseradish crème fraiche was as hearty as anticipated and seasoned just right. “The Original” Bunny ($4) with chicken curry, coconut milk, chickpeas, cashews, raisins, and cilantro tasted like a mild Thai curry. There wasn’t a lot of heat to it, but the spices and flavors were robust. 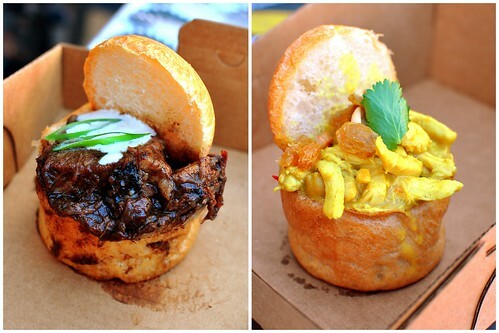 Bunny chow is the kind of stick-to-your-bones comfort food that makes me smile. 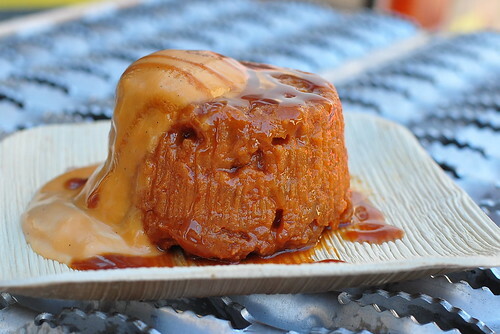 Lastly, we dug into a decadent and delightful butterscotch bread pudding ($3). It was heavy, yet heavenly. 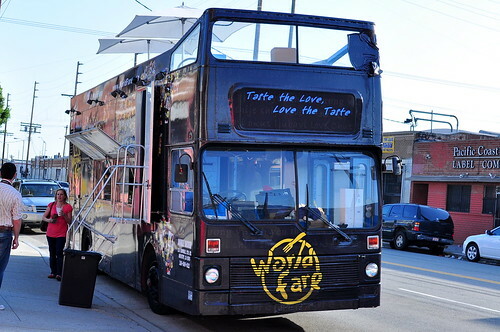 Follow the World Fare Bustaurant on Twitter @WorldFare. From what I see in your pics, I’d love to taste the love. Are those paper plates? If so, they are the coolest paper plates ever. I was less impressed. And less less impressed after reading your post: your food looked a lot more generous than what I was served when paying for the food. I can’t believe I missed the World Fare bus after the FBF Seminar. Oh well next time. Congrats on you wedding day. That photo of you and your mom was very cool! “bunny chow” sounds too dang cute. love the umbrellas on top of the bus and will totally try it if it rolls around my hood at a decent dining time. I agree, Sunday. The food tasted just fine but there was a lot more bread than filling and it certainly wasn’t as full as in these pics. Also, I felt that there was way too much packaging to hold the plates. Even if it’s biodegradable, the cardboard containers could be smaller. My fav truck so far is the Dim Sum Truck. I can’t keep up with all the food trucks, but I’m a fan of the packaging, so I’m going to see about tracking this one down! The Bunny chow looks and sounds great! Bread goes great with any stew or curry :). Those paper (?) plates look totally high end in your photos. Hi, Mrs. C! 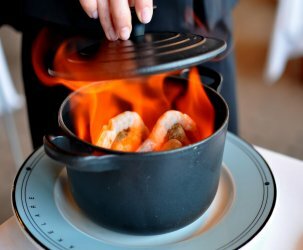 Thanks for the link and mention in your post! Those truffle mac ‘n cheese balls were sooooo excellent! Yum. Glad Mr. DG and I got to share some bunny chow and refreshing drinks with you at the Bustaurant! 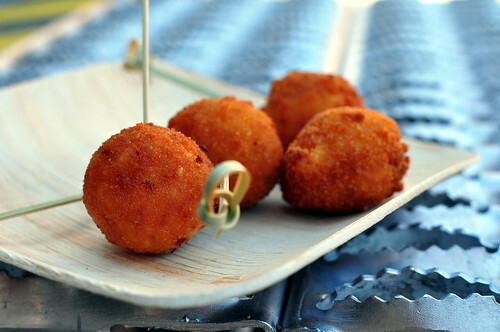 Truffle mac n’ cheese balls? That sounds even more enticing than the bunny chow! Thanks for the 411! This is another food truck I haven’t tried yet. 🙂 But it sounds like this one is definitely worth a visit over many of the others. Do you know if it’s Cash Only? Thanks. EK – I am uncertain whether or not World Fare is cash only. Maybe Tweet at ’em?